The museum staff has not found information on “North Bend Charlie” yet. If you know something, post it in the comments. Thank you! Edited: According to page 7 in Jack’s History of Fall City compiled by Jack Kelley, local Fall City Historian, it gives information about the photo. 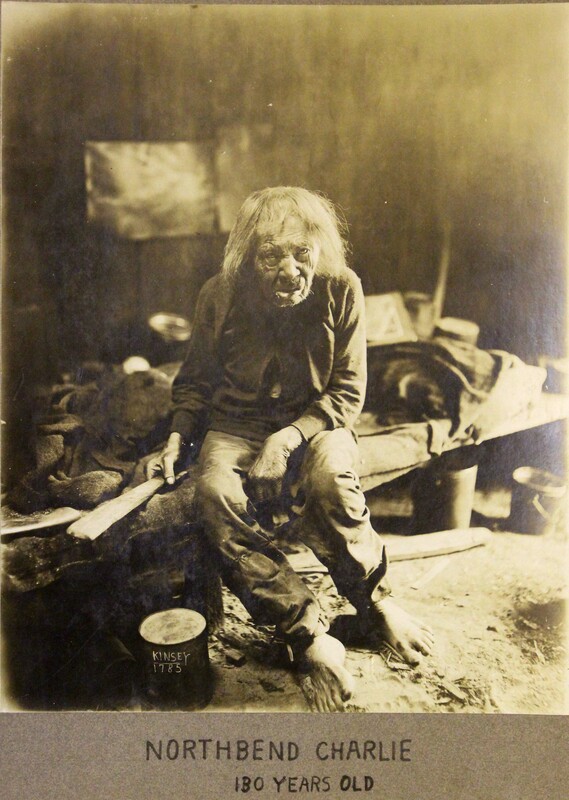 Locally he lived in Fall City and according to history was a medicine man in his early years. The book includes a photo of a small building built for him by community members. He is referred to as “Indian Doc.” He died in 1909. Here is more information. Not yet verified: Our info calls him Indian Doc or Doc Hawich. He lived at the mouth of the Raging River in Fall City and supposedly was 130 when he died. He was a Snoqualmie Tribe member and a medicine man who was well respected by both American settlers and the Snoqualmie. We don’t have a lot on him but King County did supposedly build him a home and the story is that he tore out the wood floor and stove and built a fire in the center of the room as would have been traditional in the homes he had previously lived in. It is a Kinsey, the brothers learned photography just up the river and frequently visited their sister who continued the rest of her life in Snoqualmie.